With livestreams now the standard, here are the top ways brands are continuing to push innovation via Fashion Week. The most hotly anticipated show this season was anything but couture. Topshop partnered with Google+ to shatter whatever remained of the fashion show-public divide, unveiling interactive experiences at every step of the way. Building on last season's Customize the Catwalk initiative with Facebook (engaging over 2 million online viewers), Topshop's show included 3-D Google Map technology giving access to the Tate Modern show space, a "Be The Model" photo booth in the flagship Oxford Street store allowing customers to try on Topshop outfits and create share-able animated GIFs, Google Hangouts between fashion bloggers, Topshop fans, and celebrities like Kate Bosworth and Pixie Geldof, live-broadcasts of model’s-eye video via tiny camera fitted to the models, and a "Be The Buyer" custom Google+ Hangout app allowing fans to 'swipe' runway outfits into a wishlist, in the process providing telling data for determining what styles actually should go to retail. Topshop's show has garnered more than 4 million viewers, and raised a startling bar for retail giants looking to make a splash with runway (Victoria's Secret, we mean you). Dueling publishing houses Hearst and Conde Nast both debuted fashion-centric hackathons at NYFW this season. Hearst's Fashion Hack (in which Post+Beam competed in) granted devs access to the Hearst API in a quest for innovative new uses of the behemoth data. Conde Nast's Fashion Hackathon sought app solutions to specific issues facing designers, as defined by industry guiding body the CFDA. The innovation here is on two levels: firstly, the prototype apps themselves, with standouts mixing fashion choices with musical taste via Spotify, pulling data from social networks such as Twitter and Instagram, and bringing the magazine format to user-curated online platforms. The second and perhaps more telling innovation, is that of the publishing houses themselves. Amid the unclear future of print media and under-monetized online sites, Hearst and Conde Nast are making a clear effort to adapt to changes in the industry. They have the content, but need to look outside the traditional business model to remain relevant and profitable. Here, that means seeking novel ideas for tapping into the quick-growing mobile market and redefining reader-media interaction. Hearst Fashion Hackathon winner, Drobe. With a continual focus on live reporting, it was no surprise Twitter's new video sharing app Vine emerged as a platform du jour at Fashion Week this season. Vine seems uniquely suited to Fashion Week coverage, as the looping rotation allows capture of multiple looks while giving viewers a sense of movement of the clothes. Vine use during the week included fashion press offering a real life runway experience, as well as designers giving a behind-the-scenes glimpse at the week's action. Despite the added value of efficiency and movement, some may still prefer experiencing Fashion Week from afar via imagery - nymag.com coverage even offers multiple shots and angles in a single frame - rather than the jumpy snippets of Vine. As many a fashion vet will attest, runway shows are often more impressive in pictures then in person (hello: lines, 60 minute delays, awkward viewing angles, and, oh yeah, more lines). In recent months, all eyes have been on Alexander Wang as the design wunderkind embarks on his first season as dual head of his own label and creative director for Balenciaga. Amidst that mayhem, Wang also unveiled a new project with Samsung delivering a crowsourced handbag. 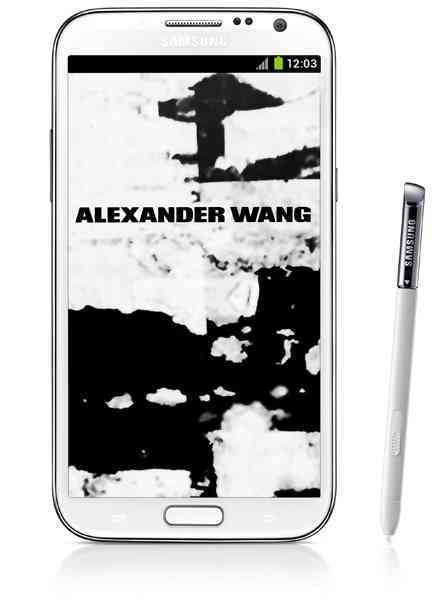 Using the GALAXY Note II's Create & Share function, Wang collated a print from doodles shared by his fashion insider friends, which will be turned into a limited-edition bag in stores this summer. Crowdsourced design is nothing new, but remains rare among prestige brands - a mass-designed prestige good is inherently oxymoronic. However using an elite technology (the GALAXY Note II), an even more elite 'crowd' (including supermodel Coco Rocha), and limited distribution elevates this item above the fray. Or perhaps Wang was just low on creative juices running his dual posts and needed a little design help from his friends. During the @kennethcole runway show, out of respect for other members of the audience please make sure your phones and tablets are switched ON. This show will embrace the intrusive nature of social media. Like many, Kenneth Cole's show was livestreamed and allowed virtual viewers to snap a photo of the runway and tweet it with a custom message and the right hashtag (technology provided by Bume Box). The livestream also appeared on a wall in their SoHo store, with participation bolstered by the added incentive of $1 for every tweet donated to charity and the chance to win $500 shopping session. Lest you needed one last reminder, models walked the finale with smartphones in hand.